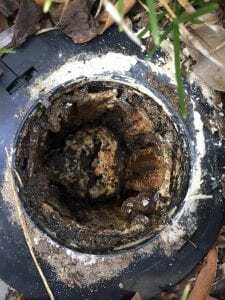 Photos here shows that Termites have eaten 70% of the bait applied after an infestation was located in a monitoring station at customers home, we are now confident the termite colony will be on its way out. The time of colony elimination may vary depending on the size of the Colony. Many assume that you just install monitoring stations in the ground and when you find active termites, you just spray them with what ever you can find around the house, well this is an uneducated assumption as 99.9% of chemicals solutions you buy off the shelf will never kill the Termite colony through the use of a monitoring and baiting system and will only kill the termites you spray directly, leaving millions of termites still active well beneath the soil/ground on the way t o eat your house. The Solution being Requiem bait in the above photo once consumed will kill the nest over a period and may not just take one feed, so more baiting maybe required but the result is saving a home owner thousands of dollars in damage repair bills. NOTE: Any Termite monitoring system should state that stations are to be installed every 3 meters and never exceed 6 meters across drive way entries. You do the calculations your self, measure the entire perimeter of the house and divide by 3, ( 75 / 3 = 25 ) this will provide you with the exact amount of stations to install. Remember that if you have concrete areas/paths, then the station may have to be installed in the concrete where the concrete is cored out at around 80mm diameter to install the station. Ongoing monitoring & Baiting is essential BUT be sure to use the correct “BAIT” before you find your self in even more financial trouble when Termites were just keeping damaging your home.